Central South University (CSU) in Changsha, China, has around 55,000 students and 20,000 staff and is in the top 20 of 2800 universities in China. There are 38 universities in China with mineral processing departments, and CSU, which specialises in non-ferrous metals, is ranked number 1, and is the largest, with 110 staff, 1000 undergraduate students and 500 post grads. It was recently ranked number 2 in the world in the ShanghaiRanking's Global Rankings for 2018. Around 40% of the mineral processing graduates stay on for post-graduate work, and roughly 20% go into industry or to Institutes. Despite its unwelcoming austere building and dreary corridors, the Department of Mineral Processing and Bioengineering has some outstanding staff and young researchers, performing cutting edge research in mainstream and innovative mineral processing. All but three are from China; Mohammed Kabashi graduated from the Omdurman Islamic University in Sudan, and came to Changsha a month ago as a lecturer in mineral processing and is researching for PhD on the processing of tailings. Happy Mulenga, a graduate of the Copperbelt University in Zambia, has been at CSU for one year on the MSc mineral processing course, and researching on new reagents for flotation with Prof. Wei Sun. Sultan Ahmed Khoso is a lecturer in the Mehran University of Engineering and Technology in Pakistan, and is at CSU working for a PhD on the flotation of sulphides. I spent four days at CSU last week, having kindly been invited to present two short seminars, and to be honoured in a ceremony to confer on me Honorary Professorship of the University. The photo below was taken after the ceremony with some of the mineral processing researchers. On my left is Prof. Tao Jiang, Dean of the School of Minerals Processing and Bioengineering, and on the right Prof. Xuehong Zhu, Vice-President of the University and QingLyu Liu, Deputy Head of the Human Resources Department. Previous mineral processing appointments to this position have been to Prof. Ponisseril Somasunduran of Colombia University, New York, Prof. Jan Miller, of the University of Utah, and Prof. Roe-Hoan Yoon, of Virginia Technical University, all three recipients of the IMPC Lifetime Achievement Award. I spent some time talking to leading researchers and in all cases was immensely impressed by their dedication, enthusiasm and amazing work ethic- there doesn't appear to be much time for outside interests if you are a researcher at CSU! The tireless Dr. Zhiyong Gao arranged and hosted every minute of my visit, including dining with me each day at lunch and dinner, and even spending time to show me the city of Changsha, the capital of Hunan Province, with over 7 million inhabitants. Zhiyong is a fine ambassador for the department and CSU obviously recognises this, as he now represents the department overseas, his first outing being to the IMPC in Quebec two years ago. 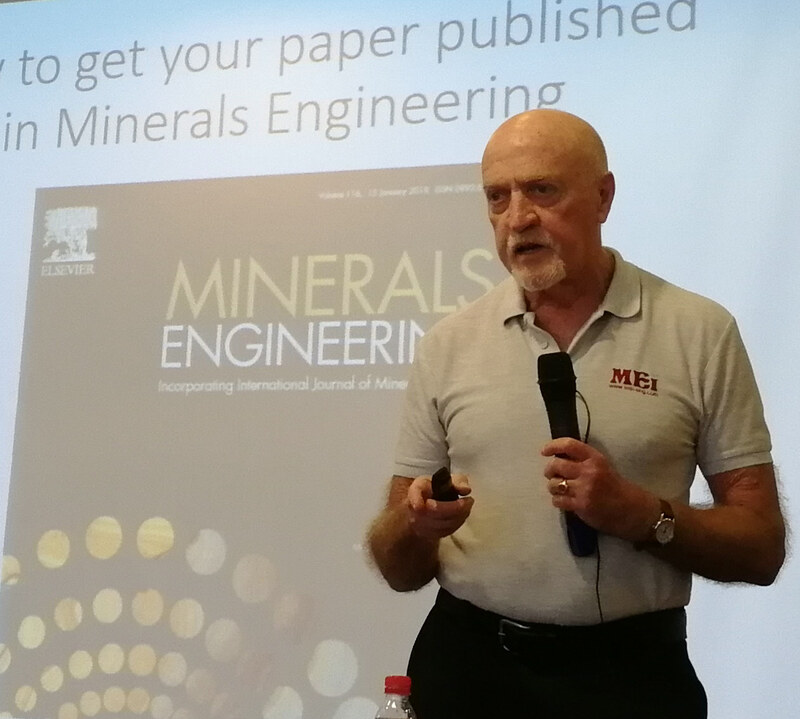 Last year he presented a paper at Flotation '17 in Cape Town, which was recently published in Minerals Engineering, his 7th to be published in this journal, and last month he was presenting at the IMPC in Moscow. He is an outstanding researcher in one of the main thrusts of the department, flotation chemistry, in the team led by Prof. Yuehua Hu, who I unfortunately missed as he was away in Beijing. Zhiyong's 2015 paper on scheelite flotation is the 6th highest cited paper ever in Minerals Engineering, a notable achievement that he must be proud of. I feel sure that he is a person destined for great things in our profession. Dr. Haisheng Han and Dr. Yanhong Wang have both spent time at Australia's University of Queensland. Haisheng is working on the design of new collectors and using mixtures of metal ions and collectors for the flotation of oxide minerals. New collectors for scheelite are now being used at the Shi-zhu yan mine, China's biggest polymetallic deposit, separating scheelite and wolframite from fluorite, calcite and other silicate minerals without the use of traditional sodium silicate depressant. As sodium silicate is also a dispersant, its absence also has great advantages in water treatment and circulation. He presented this work as a poster at Flotation '17. He is also working on the removal of arsenic and other heavy metals from mining and other wastes, but this work has not yet been published. Yanhong Wang was awarded a PhD from the University of Queensland on the mitigating effects of clays on copper flotation, which was presented by poster at Flotation '15, and she was presented with the award for best poster at the conference. She continues with this work at CSU. 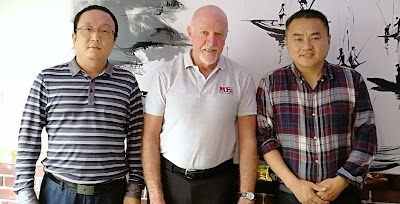 I had lunch with Prof. Zhao Zhongwei, who is Vice Dean of the School of Metallurgy and the Environment and works closely with the Mineral Processing Vice-Dean Prof. Wei Sun on the extraction of tungsten from mainly scheelite. China is the world's largest tungsten producer, and around 80% comes from scheelite. He is also carrying out very topical work on the recovery of lithium from brines using an electrochemical method which has very high selectivity of lithium from magnesium. The work has been published in Hydrometallurgy (Volumes 133 and 176) and a pilot operation on a salt lake is now underway in Tibet. Over morning coffee in the common room, I spoke to three more dedicated researchers. There are many lithium deposits in China and Dr. Dong Fang Lu is working on the use of mixed anionic and cationic collectors for fine spodumene flotation, as well as fine particle capture in HGMS. He is also involved with modification and optimisation of two Australian inventions, the Jameson Cell, which is being modified for spodume flotation at high altitudes, and optimisation of the Reflux Classifier to preconcentrate antimony oxide tailings. Dr. Jian Cao has only been at CSU since July and is openly delighted about his appointment. He is an organic chemist and he is working on the design, synthesis and application of flotation reagents, particularly for serpentine depression, and new activators as an alternative to copper sulphate in pentlandite flotation. He hopes to eventually build a library of flotation reagents, to include new collectors, activators and depressants. Prof. Zhiguo He talked with great enthusiasm of his work on the mining of acidophiles, and their role in bioleaching and heavy metal adsorption. He has interesting results which I would like to see him present at Biomining '20 in Falmouth. Dr. Fen Jiao introduced me to her team of fine young researchers, all of whom would be a credit to CSU if presenting work at an MEI Conference. They are researching a diverse range of topics, including the flotation of scheelite at low temperatures, selective extraction of lithium from brines, the treatment of waste waters and the biggest challenge of all, recycling metals from printed circuit boards and the recovery of lithium from spent batteries. CSU is a major force now in mineral processing research, and in recent years has hosted many leading researchers from overseas, including Profs. Roe-Hoan Yoon, Jan Miller, Cyril O'Connor, John Ralston and Jan Cilliers. 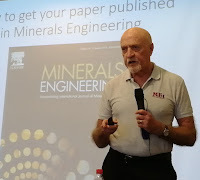 The number of publications in international conferences and journals is increasing and my second seminar "how to get your paper published in Minerals Engineering" was at first sight appropriate as 95% of all papers submitted to the journal from China are rejected, compared with a worldwide rejection rate of 82%. However, I suspect that CSU contributes little to this extremely high figure. Naturally I stressed that presenting work at an MEI conference is a great aid to publication, as the conference itself provides the first peer-review of the work, and presenting before an international audience improves confidence in presenting in English. In this respect I suggested that maybe their internal research seminars could be in English, as well as written interim reports. I believe that China's first university to teach solely in English is the Southern University of Science and Technology in Shenzhen. I would like to thank Zhiyong and the rest of the faculty staff for making me so welcome in Changsha and conferring on me their very special honour. If you are interested in collaboration on any of the projects mentioned, please contact Dr. Zhiyong Gao at zhiyong.gao@csu.edu.cn who will pass your message on to the appropriate project leader. All in all my visit has been a real eye-opener; I have visited countless universities and research institutes over the past decades, but I can honestly say that I have never met such an impressive team of young researchers and staff. I did not have time in my short stay to discuss undergraduate teaching, but as 40% of the post-graduates are from CSU, and teaching is only by faculty members of at least Associate Professor level, then they can't be doing many things wrong! I can say with complete confidence that CSU will play a major role in the future evolution of mineral processing. Congratulations, Barry, on this prestigious appointment. It is also very good to see this type of newtork. This is the most impressive aspect of your Blog,Barry. You spot talent, bring them to the notice of the others in the profession, encourage upcoming(future for the profession) researchers--in this process you travel with that smile and make subtle remarks. CSU is a very fine University with an enthusiastic core of academic staff within its dynamic Department of Mineral Processing and Bioengineering [DMPE]. The Department and University are reaching out worldwide, establishing links with excellent universities and research institutions. The University of South Australia, through its Future Industries Institute, hosts a Joint Research Centre on In-Line Chemical and Mineral Sensing for Sustainable Mineral Processing. It is a great pleasure to work with CSU. The spirit of cooperation is excellent. Having listened to your lecture at CSU, impressed. Come on CSU.